As now a day the mechanical keyboards are becoming more popular, many new users are opting for these types of keyboards. Even there are many offices and organizations who are ordering for mechanical keyboards for their workers to become effective and productive. It can be taken for granted for sure that mechanical keyboards are much better than any mechanical keyboards available in the market. 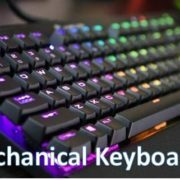 With the use of mechanical keyboards, one can type much faster, can be more accurate with the button tapping, can avoid the ghosting-key problem completely, and also mechanical keyboards are much more durable than a membrane keyboard, so they tend to last longer. Hence buying a mechanical keyboard is always a good idea. As there are many brands are coming up with mechanical keyboards one may be confused that which one to go for. One can go for the looks, while one can go the budget product, or one can go for the high-end costly products according to their choice. But, the question arises here, that is there any other type of technical issues in the mech-keyboards about which one should know before buying? The answer is, Yes. There are many types of switches available for mechanical keyboards. Also, there are many types of keycaps available for mechanical keyboards. So, there are actually two questions here, first is which switch to go for, then the second one is which keycap to go for? The mechanical switches can be divided into three categories according to the behavior of the keys. All of the above types of switches is good for any kind of users. Anyone may feel more comfortable and more responsive behavior from the keyboard for sure. If one is looking for a keyboard for gaming, then looking for just any mechanical keyboard is not a good idea. As a gamer need a keyboard which is filled with the anti-ghosting property and of course a tactile feedback of key depressions. But a gamer should look for the actuation force of the key tapping in the keyboard, as low actuation force can be the cause behind the accidental wrong key tapping. While low actuation force is actually very good for the ethical typists. But even in case of gaming, some gamer may find the low actuation force in their favor as they can register the key quicker than the others, but to avoid mistakes they should practice a well. So if going for fast-paced game like CS:GO, then choosing the Liner switches can give you an edge. While for the typists any kind of mechanical switch is good; if that person feels comfortable on it. So, trying before buying is the best idea for the one who is looking for a keyboard for typing. The types of keycaps vary from keyboard to keyboard. According to the keycaps the mechanism and made of the switches also vary. So, while buying a keyboard looking at the specification is really important to know about that specific keyboard to understand that it poses your desired combination or not. The most popular types of keycaps are the Cherry MX keycaps, which was actually first released in the mid of 1983. They considered as the most used and most popular types of mechanical switches. Suitable for – Gamers who are looking for fast action with minimal resistance. As it has very less tactile feedback, it is not the best choice for any typist. Suitable for – Gamers who are looking for more resistance in the keyboard. It is very good for spamming the keyboard or any single button again and again. As the slider is a single piece, there is no hysteresis. Suitable for – One of the best for typing. The loudest in the Cherry MX family, it gives the distinct sound of “click” while the key is pressed. It has the best tactile feedback, so again good for the typists. Not recommended for gamers at all. Suitable for – A very good one for mix users. It is good for gaming and typing both. It is actually the widely chosen by the users for its all-around use. It has a good tactile bump, silent while traveling, medium actuation force, less hysteresis than the MX blue switches. Recommended for all users. Suitable for – It is mainly used for fast-paced gaming. The typists who do not like much travel distance, or just want to travel as short as possible also can go for this. This key has the lowest actuation point distance. But, accidental key tapping can become a problem in this switch, which can be avoided by practice. Kailh switches are also very popular among the mechanical keyboard users now a day. It is made by the company named Kaihua Electronics from China. Kaihua also do produces custom switches for mech-keyboards. The “Kailh” switches are often referred as “Cherry MX Clones” as they are identical in design. 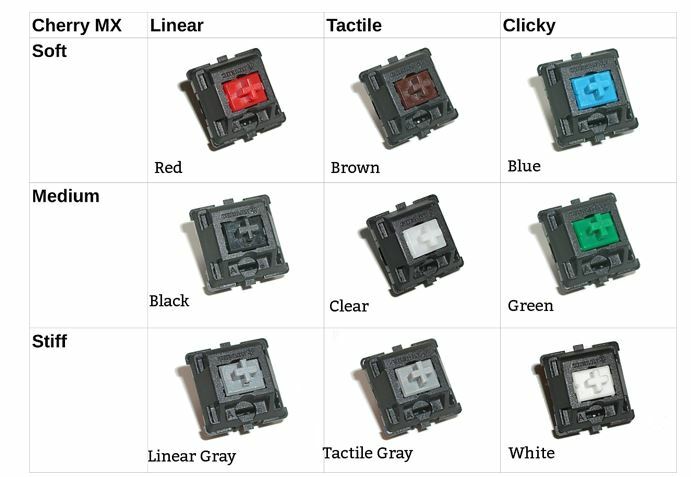 The colors codes and even the characteristics are the same as Cherry MX switches. Even the Kailh switches are also compatible in the Cherry MX stems. Kailh switches are also mainly divided into four types i.e. Red, Blue, Brown, Black and the characteristics are just the same as MX switches. 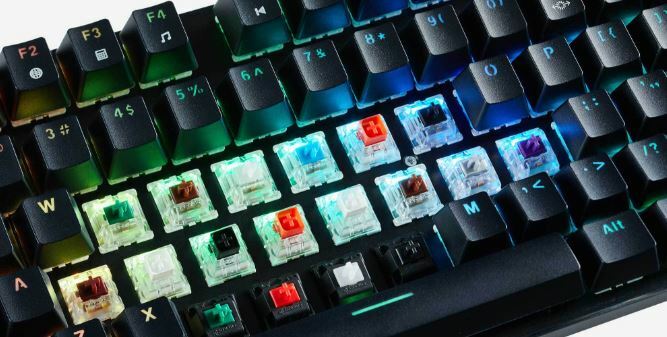 Apart from the above, gaming peripheral production company Razer introduced Razer mechanical switches in 2014, in their own gaming keyboards like Razer Blackwidow. The other producers like Kailh is also producing the clone of Razer switches which may come cheaper than the originals. Razer has mainly three types of switches available in the line till now. Suitable for – It is comparable with Cherry MX Blue switches. It is good for high-speed typing, gaming may be a little problematic due to the higher resistance of the keys. The longevity of Razor keys are much more than any other mechanical keys for sure. Suitable for – It is comparable with Cherry MX Brown switches. It is good for typing, and best for gaming. It has a silent tactile bump and a single-piece slider architecture. Suitable for – It is comparable with Cooler Master Mem-Chanical switches used in CM Devastator II. It is a very good choice for gaming. It is actually any gamers cup of tea. But mechanical switches uses rubber dome technique, because of which it may last lesser than any other mechanical switches. Logitech has also designed a Mechanical switch named as Romer-G. It is used in some of their own keyboards like Logitech G810, Logitech G910. 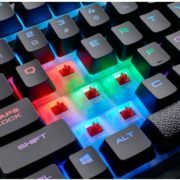 They switch is made to overcome the flaws of the mainstream mechanical switches, which makes it very effective in gaming, and very useful for fast typists also. Suitable for – Fast paced gamers and enthusiast typists. It is also very good in durability. Its short travel distance plays a huge role in improving the rate of repeating keystrokes in game. The reset point is closely aligned with the actuation point, which ensures no Hysteresis. Steel series has also developed some mechanical switches in a collaboration with Kaihua. That switches are being used in their own keyboard Apex M800. The switch is known as QS1. Suitable for – It is comparable with Romer-G switches. Very good option for fast-paced gaming. The light actuation force and higher actuation point made the key spamming easy. It is a very good option for any enthusiast typist. It can be said clearly that there is no “best keyboard” actually exists. The definition of best varies from user to user. There are some aspects to look in a keyboard before buying. One should definitely try as many keyboards as possible to understand the specific need for himself. Though there are some keyboards which are recommended for gamers only and some are for the typists only. But, getting an extra edge by using those keyboards is not ensured. Any gamer may find a typical typing keyboard good for gaming and any typist may find a gaming keyboard good for typing. So, it does depend on the user. If someone is going to try a mechanical keyboard for the first time, going for a balanced option is always good. Which may narrow the search down to the Cherry MX Brown switches, Kailh Brown switches, Razer QS1 or Romer-G switches. 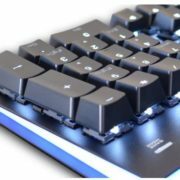 Using a Hybrid Mechanical (Mem-Chanical / Mecha-Membrane) keyboard is also a very good idea, as they are very good for typing and often selected by many Pro gamers. One can also try out different switches by borrowing or buying to taste the flavors as well as to decide the best suitable switches for his fingers. It is to remember that no Keyboard will make you a better gamer or an Expert typist overnight, to be any of them you need to practice a lot. But practicing in the best-suited peripherals is the best idea. If looking for Cherry MX Brown switches then one should try keyboards like Corsair K55, HyperX Alloy HX-KB1BR1, Cooler Master Masterkeys etc. Tring out the MX Brown switches is same as trying out the Kailh Brown switches Logitech G431 is a good choice if one is about to try out the Romer-G switches. Steel Series Apex 800 is the only choice to try out the QS1 switches. If looking for Hybrid Mechanical switches then CM Devastator II, Devastator III or Cougar 450K is a good choice to go on. If you are looking for a mechanical keyboard for the first time and on a tight budget then you can go for Red Gear MK881 Invador, which is really very cheap in price, it uses Kailh Blue switches, but it will definitely give some decent ideas and experience of the Mechanical Keyboards.